Draft Lifeform Map: We are excited to announce that a draft lifeform map is complete and available for download. 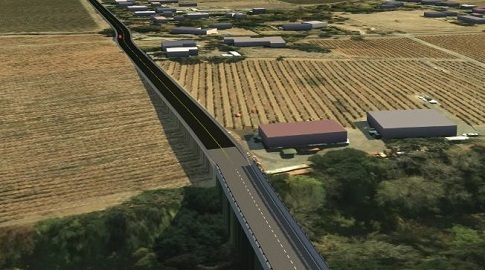 It will serve as the foundation for the more detailed vegetation and habitat map to come. 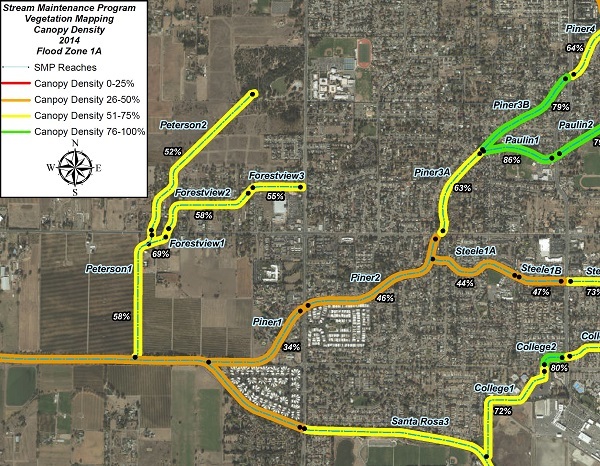 This 18-class map was developed using a combination of automated, software-based processes and the input of GIS and vegetation analysts. Follow this link to learn more about the lifeform mapping methods. 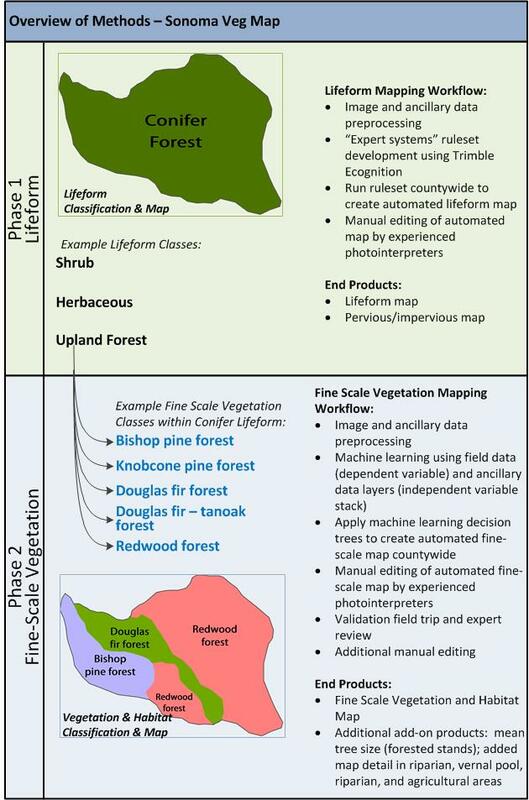 The draft lifeform map (see interactive webmap below) will be refined in 2016 based on the field work and additional manual editing associated with producing the full 62-class fine-scale vegetation and habitat map due out in late 2016. Until then, the lifeform map can serve as an excellent reference map with high accuracy (read the accuracy assessment at the end of the product datasheet). Please reference this as a draft data product in your maps, analysis, and derivative products. Final Croplands: The Sonoma County Croplands map, which we released as a draft product in the spring, has been updated and finalized. The croplands data provides a countywide fine-scale polygon map of perennial croplands, annual croplands, nurseries, orchards/groves, vineyards, and other crops. The croplands were mapped by image analysts using aerial photographs as ground reference and – as for the lifeform dataset above – this layer represents the state of the landscape in 2013. The croplands data combines many years of quality mapping work by many hands – including Circuit Rider Productions, Dr. Adina Merenlender’s Lab (UC Berkeley), the Sonoma County Agricultural Preservation and Open Space District, and the Sonoma County Water Agency – into one seamless dataset. 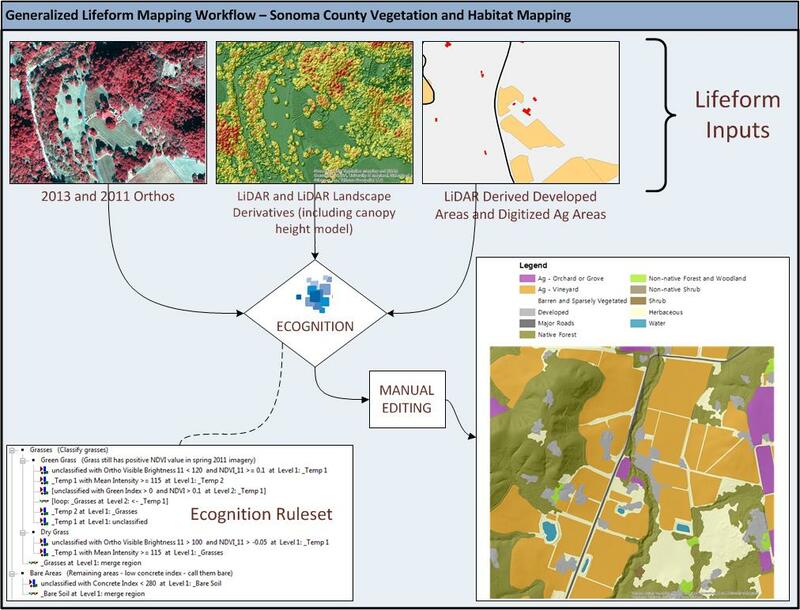 During the past year, the Sonoma Veg Map mapping team has further improved and standardized the data, adding hundreds of new polygons and refining the majority of existing ones. The lifeform and croplands are available as services from ArcGIS.com and as GIS data downloads (shapefiles and geodatabases). To download the data, go to the data downloads page on our web site. 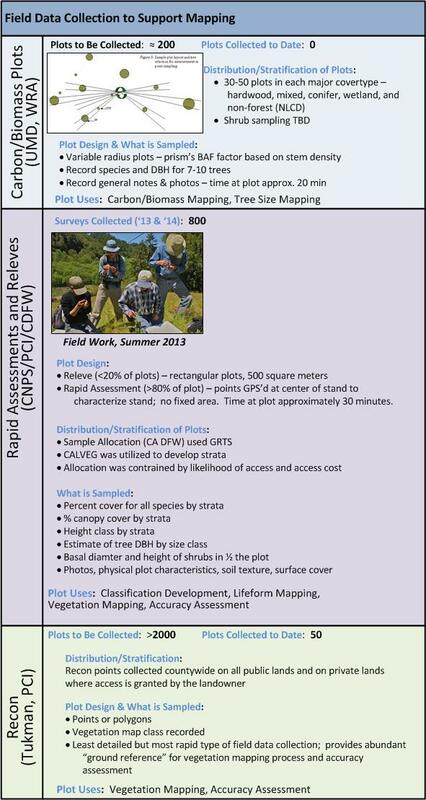 Also, download the product datasheets for the croplands and lifeform datasets. For an immediate look at the lifeform map, check out this webmap. 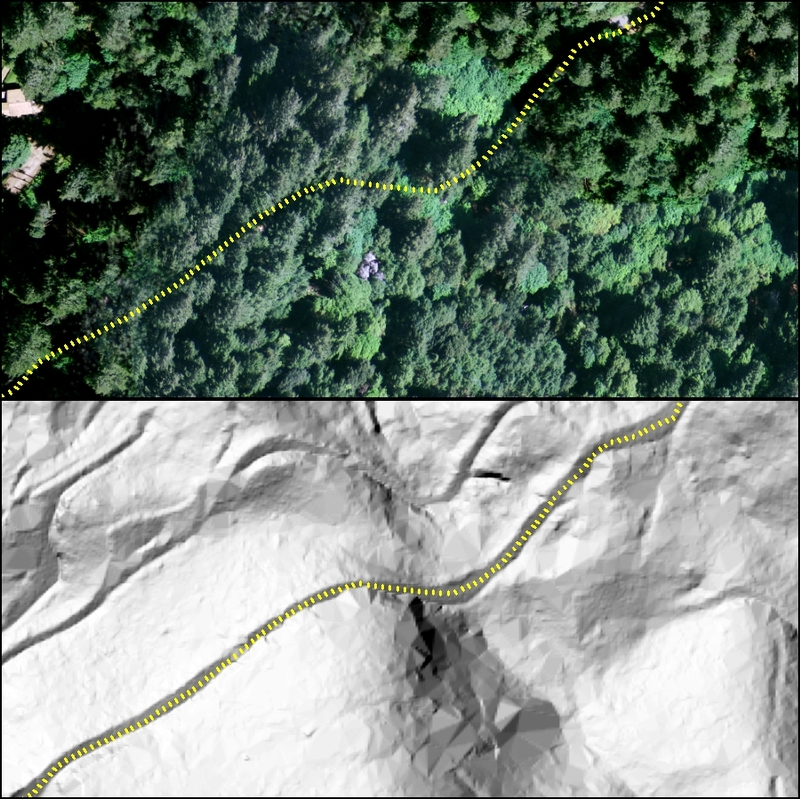 As part of its Streamside Maintenance Program (SMP), The Sonoma County Water Agency has been using the 2013 Countywide LiDAR data to help manage vegetation within 175 miles of stream channels they are responsible to maintain for flood control. Each summer, the Water Agency works to remove undesirable vegetation and prune riparian trees. The goal of this work is to transition these channels into waterways that not only provide flood protection, but also provide good riparian habitat and water quality. With this type of management continuing over time, channel vegetation will grow and mature, with alders and other trees stretching their branches over the creek, cooling the water and shading out non-native blackberry and other less desirable species that reduce the water-carrying capacity of the creek. To help identify where to promote the growth of desirable riparian trees, the water agency needs accurate maps of tree canopy density, or the portion of the ground overhung by trees. Tree canopy density was produced countywide from the 2013 LiDAR point cloud for Sonoma Veg Map. Before LiDAR, canopy density mapping required manual aerial photo interpretation – a laborious and costly effort. The LiDAR-derived canopy density data was used by Water Agency GIS staff to efficiently create maps of tree canopy density by channel reach (see map below). Water Agency staff are using these maps to target future vegetation management activities to where they are needed most. By comparing the 2013 LiDAR derived density maps to older canopy density maps, Water Agency staff can also evaluate the benefits of past vegetation management activities on riparian habitat. For more information, contact Keenan Foster. This entry was posted in Uncategorized on May 9, 2015 by admin. Through a grant from the Sonoma County Water Agency and the Sonoma County Agricultural Preservation and Open Space District, the San Francisco Estuary Institute (SFEI) has digitized, georeferenced, and mosaiced a subset of the photos – those that comprise the Santa Rosa Plain. This dataset is useful for all manner of historical analysis such as understanding changes in land use and population, and tracking changes in vegetation and habitat over time. Check out the embedded map below (click here for the full version) to easily compare what things looked like in 1942 to what they look like today in the Santa Rosa Plain. Watch out – it’s addicting! You can also download the air photography here (700 MB .img file). 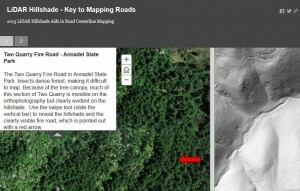 If you want to use the photography as an ESRI image service, search ArcGIS.com for ‘Sonoma County 1942’. Welcome to the Sonoma County Vegetation and Habitat Mapping blog! This blog will facilitate an ongoing discussion between the mapping team, the map’s stakeholders, and end users of the maps. We will also use this forum to make our community aware of program related events and milestones. This entry was posted in Uncategorized on November 16, 2012 by mtukman.